In the light of World Tourism Day falling on 27 September, it’s worth remembering that an integral part of promoting tourism in Sri Lanka is to spread awareness among travellers about the island’s rich cultural heritage. After all, the national and historical identity of a country is rooted in its archaeological monuments and sites. 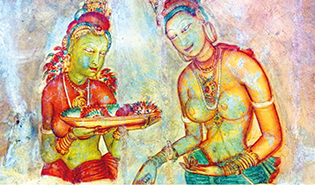 Sri Lanka lays claim to splendid old memorials and cultural artefacts in its ancient cities. The demarcating points of the Cultural Triangle are Kandy, Anuradhapura and Polonnaruwa, which are home to World Heritage sites. It follows that their preservation and protection plays a pivotal role in expanding cultural tourism, for which the responsibility lies with the Department of Archaeology, Central Cultural Fund, National Museum of Colombo and other relevant institutions. Cultural heritage and art have contributed to the appeal of tourist destinations for decades. More recently, culture has become a vital marketing tool to attract travellers who have a special interest in heritage and art. This is the tourism industry’s fastest growing sector especially in the developing world with an increased interest in this facet of travel among visitors. This is evident in the rising volume of tourists who seek adventure, history, archaeology and interaction with local people. Heritage tourism has a positive economic and social impact, and establishes and reinforces identity. It supports culture and helps renew tourism, by providing financial resources for protecting and preserving archaeological sites and monuments. In a sense, cultural tourism is a form of elitist tourism as it attracts highly educated travellers and specific interests – particularly an affinity for the history that denotes a destination’s culture. The most important finding in recent archaeological excavations relates to evidence that Sri Lanka’s civilisation stretches far beyond its recorded history of 2,500 years. Initial discoveries by the former Director-General of Archaeology Dr. Siran Deraniyagala were followed up by Professor Raj Somadeva who is the Senior Lecturer in Archaeology of the Postgraduate Institute of Archaeology in Colombo. According to Somadeva, continuous research has uncovered prehistorical facts that marked a turning point in the country’s history and opened up new fields in archaeological research. Evidence of the prehistoric age has been discovered at sites in Kitulgala, Belilena, Bulathsinghala, Pahiyangala and Ibbankatuwa. Since 2010, the Postgraduate Institute of Archaeology at the University of Kelaniya has been working on a research project with the objective of studying and discovering evidence in this area. Somadeva heads a six member research team that is working on this project. It is uncovering evidence of Homo sapiens who lived in the country’s hinterland about 6,000 years ago – they’re thought to have arrived 125,000 years ago, he says. During this period, early inhabitants gradually transformed from hunters into cultivators and heralded the agricultural age. Discoveries made so far, he points out, prove beyond doubt that present-day descendants of Sri Lankans who lived in the island centuries before the European encounters are closely related by blood not to Prince Vijaya and others who arrived from the Indian subcontinent but to the Vedda indigenous people. Somadeva also says there’s evidence that Buddhism existed in Sri Lanka before the arrival of the missionary Mahinda, the son of India’s Buddhist Emperor Ashoka. Mahinda’s arrival only meant the official introduction of Buddhist teachings to the country as he handed them down to King Devanampiya Tissa. In a press interview, the professor expressed sadness over Sri Lanka’s failure to pay sufficient attention to developing archaeology. He averred that with time, there would be addenda to the history that’s presently known and taught. The professor says these discoveries call for a new discourse in the country’s historical conversation for it to be possible to have a proper perspective of Sri Lanka’s unique cognitive tradition, which shaped its culture through immigrant Homo sapiens. These excavations are bound to open a new chapter in cultural tourism and offer visitors a fresh perspective of our ancient civilisation. However, archaeological tourism walks a fine line between promoting related sites and an area’s cultural heritage, and causing more damage to them – and thereby becoming invasive tourism. Archaeologists have voiced concern that tourism encourages peculiar ways of seeing and knowing the past. Careful planning and management are essential to promoting tourism development in cultural and archaeological sites especially in ecologically sensitive areas. Indeed, Sri Lanka faces many challenges in its quest to build a balanced tourism industry. Interestingly, history and tourism are to be a noteworthy nexus. Now history is not perceived as static and boring anymore. While history has been created, told and written in a certain way, advanced sciences and technology pour in new findings that may connect the dots of existing history to a broader and a more interesting picture – with a newer version of history waiting to be discovered. As such, tapping educated travellers – who are keen to explore (deeper) and experience for a local regional experience –in the way that they should be gives rise to heritage tourism. Thus, curiosity and care should be managed carefully, and go hand in hand. The entry of Buddhism to Sri Lanka with its oldest first stupa ‘Girihandu Seya’ made by merchants Trapusa and Bahalika in northeast Sri Lanka in Buddha’s era (before the official induction in King Devanampiya Tissa’s era) is one good example that heritage tourism in Sri Lanka has potential – where tourists exploring them may lead to sustaining the lives of artisans, promote arts and crafts, authentic cuisine etc. Collaboration is the key between archaeologists, ICT and industry (hospitality, leisure, handicrafts) sectors for the designing of operational procedures as to how tourists can access these sites, and the development of e-commerce and web platforms to enhance awareness, reachability and prominence. Operations and strategies need to blend harmoniously for heritage tourism to reach greater heights.